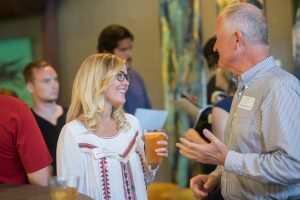 Fall Tech Mixer: The fall tech mixer is an annual gathering at a local restaurant where members and potential members get to know one another, eat some delectable finger food, and the SVTC Board of Directors serve as hosts. It’s how we introduce ourselves to the tech and general business community, catch up after the summer, and connect casually. It’s our signature fall gathering! Only one sponsorship is available for this event ($750). [Logo/name/url placement in the weekly newsletter, in the event’s online calendar date, sponsor logo/name/url included in pre-event communications, and day of the event visibility on-premise]. 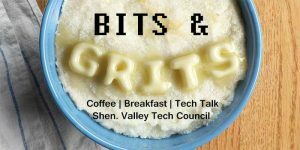 Tech on Square (Harrisonburg) and Tech on the Wharf (Staunton) are local and informal meet-ups for tech users and creators to compare notes on whatever interests them. No agenda. Dutch treat. Sometimes pizza appears. Two sponsorships are available ($100). [Logo/name/url placement in the weekly newsletter, in the event’s online calendar date, sponsor logo/name/url included in pre-event communications, and day of the event visibility on-premise]. Members-Only gathering: From time to time we gather at an interesting location in the Valley, sometimes at a spot that’s not otherwise open to the public, to get a tour of the operations within or “behind the doors”. Talk to us about hosting us or being a sponsor at one of them.